Those of us in the LGBTQPUIA2S+ community have grown used to an expanding array of terms to describe us -- clinical, colloquial and otherwise -- but when asked by a friend to define "demisexual" and "lithromantic," I realized I was losing touch and that the "+" following the acronym was taking on more substance by the day. Ironically enough, it seems that the most diverse set of terms about sexuality comes from the asexual community, like the two above. Once I started to stir the alphabet soup, I realized I couldn't be the only one who needed help. For the record, I'm not saying my confusion means the terms shouldn't exist. I just needed to find a way in. 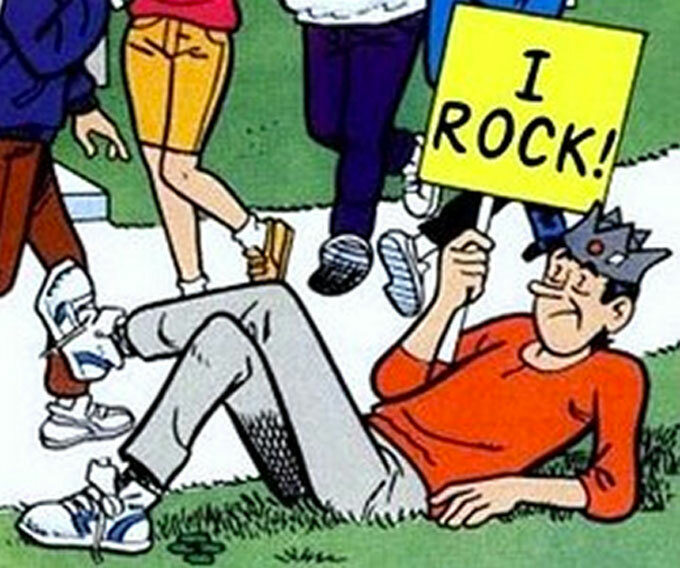 Fortunately enough, Archie Comics' revamped Jughead character recently came out as asexual, just in time for the day when many of us feel socially coerced to express some kind of sexuality. For those of you who fit under that golf umbrella known as heterosexuality, you shouldn't have any lack of options to express yourself, but for those of us who squeeze under the telescoping kind, Valentine's Day is often a reminder of the ways in which we still don't see -- and just as importantly, the rest of society doesn't see -- many accurate representations of our community. "...human beings are fundamentally and pervasively motivated by a need to belong, that is, by a strong desire to form and maintain enduring personal attachments." 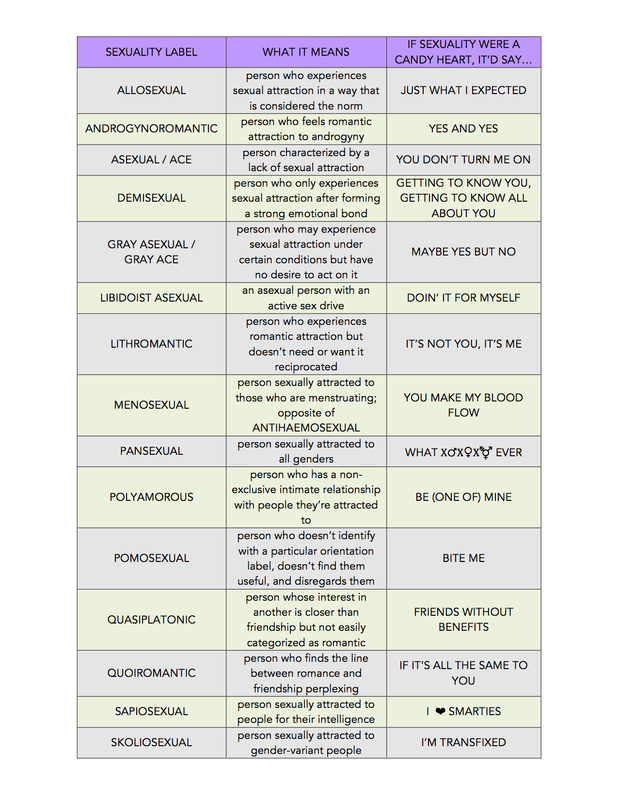 Besides that most basic need, we use labels for all sorts of reasons so I'm not sure why some people get bent out of shape about the neologisms for sexuality. We stand in front of three hundred different cereals in a grocery store and don't seem distressed that Cheerios are available in Original, Honey Nut, Cinnamon Nut, Cinnamon Burst, Apple Cinnamon, Multigrain, Frosted, Yogurt Burst, Fruity, Oat Cluster Crunch, Banana Nut, Chocolate, Dark Chocolate Crunch, Peanut Butter and even Ancient Grain varieties. I don't know what all of those mean, but I don't care either. My point is that you don't have to understand every single type of Cheerios -- do you have any idea what a Yogurt Burst is? -- in order to select the kind you like and get on with it. As for heart candy, Necco cuts somewhere north of 6 billion individual hearts per year, which isn't quite enough for everyone on the planet, but close. 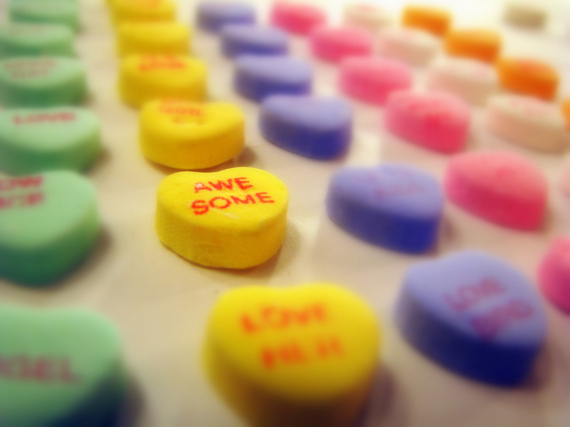 So how are candy hearts like sexuality labels? They're both about connecting, about reaching across that great divide of otherness and even if for a moment, risking and sharing what is most precious about all of us: our hearts...and if you feel overwhelmed by all the new terms for sexuality, remember, even Necco has had a few questionable choices, e.g., YOU ARE GAY. To be fair, they've retired it. They no longer put out HEPCAT or GROOVY either. So for myself and for those of you who don't understand or even know about the rapidly changing "word world" of sexuality, here's a primer on the subject, using something that is a little easier to understand: heart candy. I'll state up front that this list is neither as comprehensive nor as nuanced as it could be, so if you still feel you need more, the baton is yours. Run with it...or if you're one of those people who hates multiple choice, here's my advice: stay away from the quiz. Here are the "answers" as I see them. Feel free to add more in the comments below. Bottom line, times change. So does the lingo, and it will continue to grow long after these new terms become old, so be a HEPCAT and enjoy it.